“Amazon has the resources and scale to spark the world’s imagination and redefine what is possible and necessary to address the climate crisis,” the letter states. But even the plan behind forcing this issue to the fore took no small bit of imagination. As the New York Times previously reported, stock options—a popular perk of tech companies—allowed around a dozen Amazon workers to use their position to file shareholder petitions demanding a reduction in fossil fuel dependence at the end of last year. The number of Amazonians advocating for these policy changes, at least stridently enough to sign their name to today’s public letter to Amazon CEO Jeff Bezos, is now more than 3,5oo. These sorts of petitions usually come externally, from activist investors, such as the OpenMIC coalition, which is currently lobbying the company to stop selling its facial recognition to governmental and law enforcement clients. 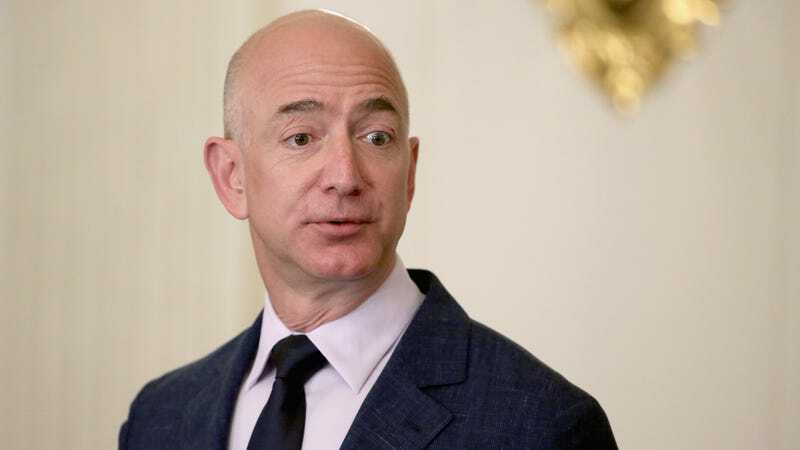 At least one of the catalyzing events this growing movement was an investigation published by Gizmodo this week, which revealed the extent of Amazon’s work with oil and gas companies. When concerns about these relationships were brought up to members of Amazon’s sustainability team, they seemed totally unaware any such partnership existed, according to the New York Times. These 3,500+ Amazonians, operating under the title Amazon Employees for Climate Justice, are joined by others, such as Google Walkout for Real Change and other unnamed groups, within big tech firms advocating for greater autonomy over who their employers do business with and what kinds of work they believe is morally odious. Google workers have been particularly successful, making headway on removing forced arbitration agreements for employees, giving benefits to temp workers, and ending the company’s involvement in a controversial Pentagon-led drone program. While Amazon has historically been slow to react to these sorts of internal demands, the company quickly responded to our request for comment—primarily by highlighting its climate-focused efforts. This includes its Shipment Zero initiative, which a spokesperson described in an statement emailed to Gizmodo as “our vision to make all Amazon shipments net zero carbon, with 50% of all shipments net zero by 2030,” as well as its pledge to release a “company-wide carbon footprint, along with related goals and programs” this year, among other energy and sustainability efforts. The Times reports that the company’s investors may have an opportunity to vote on the employee-submitted investor petition this month. We, the undersigned 3,541* Amazon employees, ask that you adopt the climate plan shareholder resolution and release a company-wide climate plan that incorporates the principles outlined in this letter. We haven’t disclosed a company-wide plan to reach zero carbon emissions within the timeline required by science. Our goal to reach 100% renewable energy does not have a date for completion. In addition, Shipment Zero does not commit to a decrease in emissions compared to current levels. Given Amazon’s rate of growth, reaching 50% net-zero shipments by 2030 could still be an increase in emissions compared to today .Shipment Zero only commits to net carbon reductions, which allows us to continue to pollute; we recently ordered 20,000 diesel vans whose emissions will need to be offset with carbon credits . Offsets can entail forest management policies that displace Indigenous communities, and they do nothing to reduce our diesel pollution which disproportionately harms communities of color [14,15].We have an AWS for Oil & Gas initiative devoted to helping fossil fuel companies accelerate and expand oil and gas extraction [16,17]. To avert catastrophic warming, the science is clear: we must keep fossil fuels in the ground [18,19].We donate to climate-delaying legislators: While Amazon has joined a variety of sustainability organizations like the Corporate Eco Forum and the American Council on Renewable Energy, we donated to 68 members of congress in 2018 who voted against climate legislation 100% of the time [20,21].Our sustainability goals lack context. For example, we’ve set a goal of at least 50 solar installations in warehouse facilities by 2020. This represents only 6% of buildings in our global fulfillment network and a fraction of our overall carbon footprint . Public goals and timelines consistent with science and the IPCC report . Emissions must be cut in half by 2030 from 2010 levels and reach zero by 2050. Goals must span all organizations and businesses, and cover the full supply chain.A complete transition away from fossil fuels rather than relying on carbon offsets.Prioritization of climate impact when making business decisions, including ending all custom solutions specifically designed for oil and gas extraction and exploration.Reduction of harm to the most vulnerable communities first. The pollution we generate is not equally distributed, and climate impact will be felt first and hardest by Black, Indigenous, and other communities of color, particularly in the Global South. We must prioritize our pollution reduction in these communities.Advocacy for local, federal, and international policies that reduce overall carbon emissions in line with the IPCC report and withholding of support from policy makers who delay action on climate change.Fair treatment of all employees during climate disruptions and extreme weather events. Unsafe or inaccessible workplaces should not be a reason to withhold pay, terminate, or otherwise penalize employees — including hourly and contract workers.